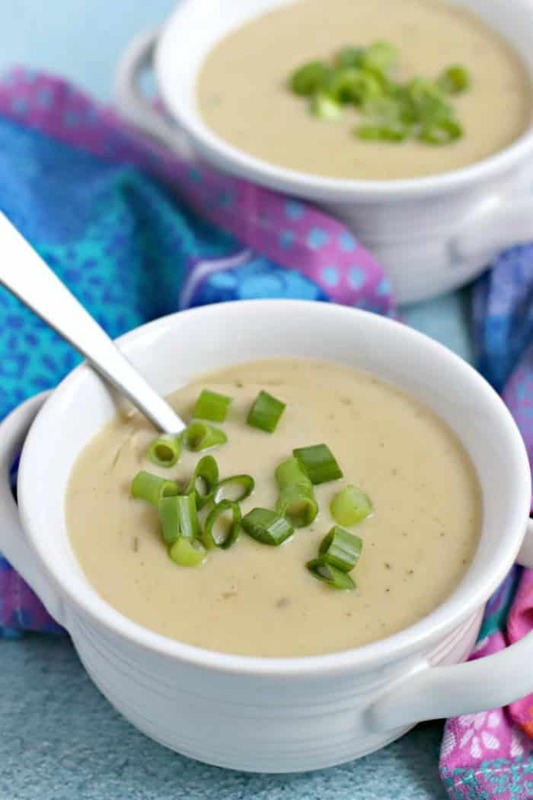 Instant Pot Vegan Potato Leek Soup is smooth and creamy without using any dairy. And it’s easy to make in 30 minutes. I love making soup in my Instant Pot electric pressure cooker. Some of my favorites are Vegan Wild Rice Soup, Instant Pot Lentil Soup, and Vegan Potato Corn Chowder. Recently I was set to make Potato Corn Chowder when I remembered I had some leeks in the refrigerator. So I decided to try my hand at making a vegan potato leek soup in the Instant Pot. And the results were incredible! Not only was the soup quick and easy to make, it was velvety and rich. All without using any dairy! One of the most important steps in making Vegan Potato Leek Soup is properly cleaning the leeks. Leeks are grown in sandy soil, and the bits of sand tend to get in the layers of leaf sheaths. And the last thing we want is sand in our soup. But fortunately cleaning this cousin of onion and garlic is relatively easy. We only need the white and light green parts of the leek, so first I remove the tough green tops. Then I slice the leeks lengthwise and clean them in an ample amount of water. In addition, it helps to rinse them again after you’ve chopped them to make sure no grains of sand remain. 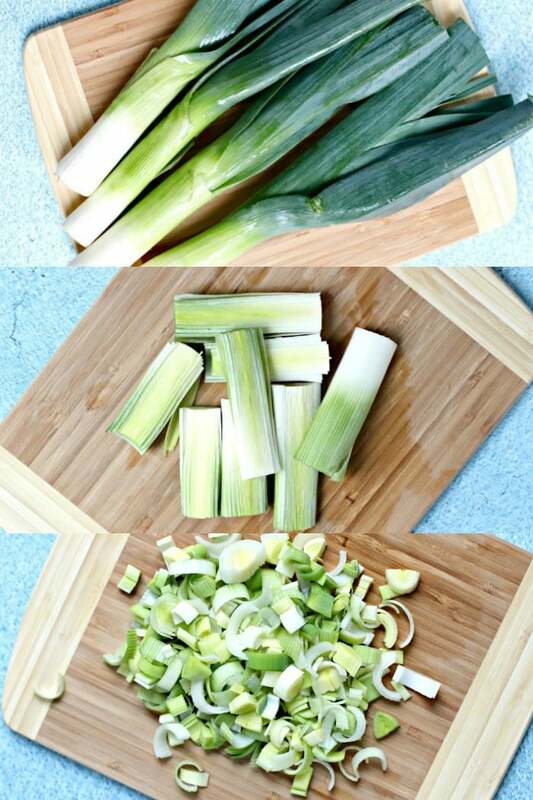 This step-by-step tutorial How To Clean Leeks is very helpful. Once the leeks are clean and diced, we’re ready to make our Vegan Potato Leek Soup. 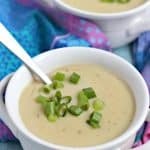 Making Instant Pot Vegan Potato Leek Soup is really easy. Traditional potato leek soup from Wales is usually made with potatoes, leeks, chicken broth, heavy cream, and seasoning. However, the vegan version is equally delicious made with vegetable broth and cashew cream. And for the seasoning, I love using herbs de provence. This French blend is typically a mix of savory, marjoram, rosemary, thyme, oregano, and lavender. I love adding it to Roasted Ratatouille, Tofu Scramble, and White Wine Roasted Vegetables. But if you can’t find herbs de provence, you can substitute Italian seasoning or your own mix of herbs such as oregano, rosemary, and thyme. Anyway, making Instant Pot Vegan Potato Leek Soup is very simple. Saute the leeks in a little olive oil (or water) until they are soft. Add the potatoes, vegetable broth, and herbs and give the ingredients a quick stir. Using the Pressure Cooker function on high, set the timer for 4 minutes. Blend the soup until completely smooth. Stir in the cashew cream and season to taste with salt. Garnish with sliced green onions or chives and enjoy! 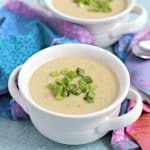 Now get out your Instant Pot, and let’s make Vegan Potato Leek Soup! 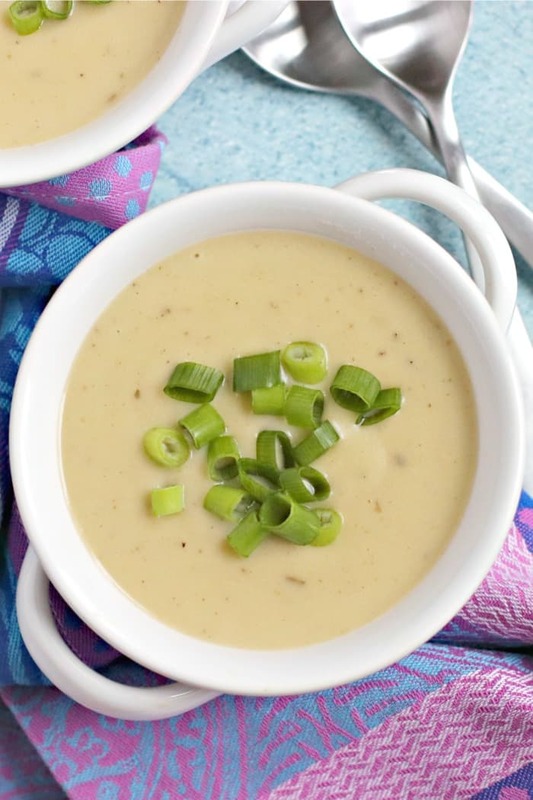 Instant Pot Vegan Potato Leek Soup is smooth and creamy without using any dairy. And it's easy to make in 30 minutes. Using the Saute function, heat the olive oil, then saute the leeks until they are very soft, stirring often. Cancel the Saute function and add the potatoes, vegetable broth, bay leaf, and herbs de provence to the Instant Pot. Give the ingredients a stir, then close and lock the lid. Set the Pressure Cooker function on high for 4 minutes. While the soup cooks, place the cashews and water in a high-speed blender. Blend until completely smooth, scraping down the sides of the blender as necessary. Set aside. After the 4 minutes on the Instant Pot are up, quick release the pressure. Once the pressure is fully released, remove the lid and carefully discard the bay leaf. Using an immersion blender, puree the soup until completely smooth. Slowly stir in the blended cashew mixture. Season the soup with salt, to taste. Garnish the bowls of soup with sliced green onions or chives, if desired, and enjoy! If you don't have a high-speed blender, soak the cashews in hot water for 3o minutes or longer to soften before blending. If you don't have an immersion blender, you can transfer the soup to a regular blender in batches, being sure to vent the lid so the steam can escape. This recipe serves 4 people. If you want to double the recipe, the 4 minute cooking time will remain the same. However, it will take longer for the Instant Pot to come up to pressure. Leftovers can be stored in the refrigerator for a few days and reheated on the stove or in a microwave. The soup doesn’t look like much but the flavor is amazing! Super fast and easy to make. And it’s Perfectly comforting in this cold Minnesota weather!